The gallery wide exhibition opens on July 22 through August 27 2017. All original works are for sale with proceeds going towards conservation and education projects in St. Augustine, the nation’s oldest city. Here is a link of last year’s participants. I am happy that my Moa Kane was accepted into the show, because I was very fond of him but it seemed he was not as popular in Oahu as I had thought he would be. 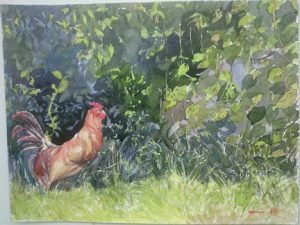 I painted him at Ho’omaluhia Botannical Gardens after watching the evening news run a story that certain residents would like to eradicate the free range chickens around the island.